Sun, sea and style set the holiday scene at Heatherleigh. 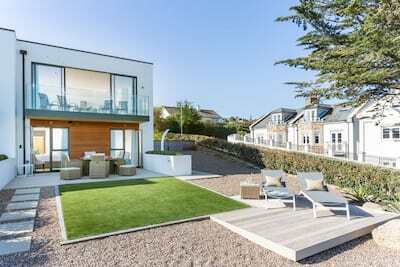 This wonderful spacious home has been flawlessly renovated to a high standard offering superior luxury accommodation in the coastal heart of Carbis Bay. Heatherleigh includes a light and sunny living space, dining area and smart modern kitchen with 4 boutique style bedrooms and 3 contemporary bathrooms. 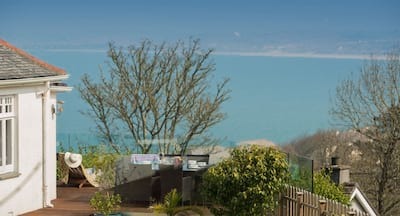 The established garden offers direct coast path access leading down to the white sands of Carbis Bay beach in moments. 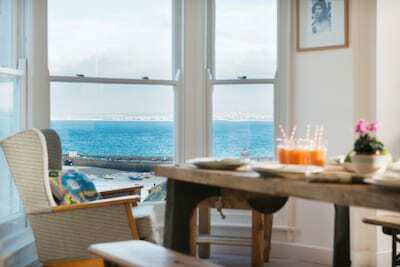 Soak up the jackpot views of the blue waters of St Ives Bay and check in for a holiday to remember. Heatherleigh welcomes one well behaved dog only. Arrive to a welcoming entrance porch with ample space for all of your holiday kit from beach buckets to jackets, wellies to wetsuits. Lead into the hub of the house, the large living and dining space. Dress the dining table to impress for any occasion be it summer supper with friends or indulgent Cornish dinner all set the the sea view backdrop. The fresh whites of the living space ensure a light and serene ambiance as guests relax after the days adventures in the West or gather as a group to map out the days itinerary. The kitchen is located just off the living space, a modern fully fitted kitchen with built in bench style seating for 4 and access to the garden. The first of the 4 bedrooms (king bedded room) is located on the ground floor with ensuite shower room. A cloakroom with WC completes the ground floor. A central staircase leads to the first floor with 3 bedrooms and 2 bathrooms. Immerse yourself in the haven of the luxury master bedroom with high vaulted ceiling offering superb panoramic seascapes and soak away the hours in the bath-with-a-view! The twin bedrooms are no less considered with a cool colour palette of nautical blues and whites with themed beach hut wardrobes. From the moment you arrive, Heatherleigh ensures relaxed comfort, considered style and holiday luxury from the location to the first class standards. A sun trap landscaped courtyard is located to the rear of the house, an enclosed space for children to safely play. The split level lawned terrace is accessed from the kitchen door, step out onto the grass and capture the wonderful sea views from your own vantage point. A thoughtfully placed dining table and chairs offers an al fresco option as the sun sets in the bay below or enjoy a morning coffee overlooking the coming and goings of beach life. The lawn is set over 2 levels with side steps between the two areas. Carbis Bay beach offers azure blue swimming waters and beautiful white sand, the beach shop brims with beach gear to keep all of the party content. A tempting beach cafe and restaurant welcome diners in all seasons. Hop aboard the branch line train and follow the coastline into St Ives, this bustling harbour town cleverly combines the heritage of Cornish life with a more cosmopolitan twist with art galleries, artisan craft shops and some of the best restaurants in the county. Further afield, the West of Cornwall is just waiting to be explored including the iconic landmarks of Land's End and St Michaels Mount, the quintessential fishing coves and hidden beaches. Heatherleigh comes highly recommended in all seasons and offers a superb base for friends and family. Welcomes 1 well behaved dog - house rules and small pet supplement apply. Enclosed garden. Heatherleigh is the best holiday cottage we have rented. The location was very convenient for the train into St Ives. The views from the garden are fantastic. It is a beautifully maintained, spacious, comfortable property. A fantastic property - wish I was there now! Just perfect, views to die for at an exceptional property! A beautiful property providing an excellent space for a family holiday. Well equipped and comfortable. We all absolutely loved it. Beautiful property in a fantastic location.